A long time ago, when I was a downtown dweller, a sketchy wiry man knocked on my door and proposed to fill my freezer with meat for $100 cash. Apparently the practice was not uncommon and someone from darts at the CEI Club had told the guy I had a young family and might be interested. It was part doing me a favour and making a quick buck. I was startled and asked him what we were talking about. He said "buddy, I got bacon, roasts, pork chops, chicken, turkeys - all the stuff you needs for da Winter." I had purchased a few quality frozen meat packages from farmers and butchers in the past - not at this kind of discount. I politely declined. Over the years, on more than one occasion, someone has offered to sell me stuff like TV's, computers and even furniture at what could only have been at five finger discounts. When I ask for the original receipt, the seller will stammer and move on. There is a very well established blackmarket culture amongst some in our community who have no issue with this practice. Others are a little more honourable, if the product is not stolen from individuals - say it is off a truck, warehouse or business - the moral dilemma is evaporates. The market in stolen goods is supported by a small army of profiteers who scour the province jacking product from businesses to supply the blackmarket. I have been told that customers can even order what they want! A story in one of may favourite magazines, The Atlantic, explored the urban black market in the United States where Tide detergent has become liquid gold. It is a favourite of shoplifters across the land of the free. Drug dealers will tell clients to pay with Tide in lieu of cash. It is something everyone needs, is pricey and is a leading brand. In today's Telegram there is a story about a couple who were caught stealing a large quantity of meat from a local grocery story. 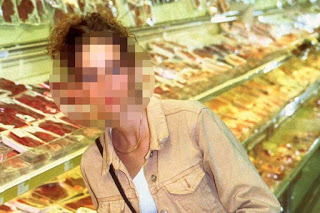 The "Meat Bandits" never pulled off the sirloin caper. Store security pursued them to the parking lot. The meat was recovered but the bandits escaped. Their images were captured on video and Newfoundland and Labrador Crime Stoppers is asking for help in identifying them. Are they modern day Robin Hoods, desperate for food or enterprising five-finger discounters filling orders? Are people on the margins pushed into shoplifting? Are people so desperate they have to turn to crime to feed their families? Are middle-class financially squeezed folks stealing treats they can no longer afford? Does it matter what the rationale? Organized shoplifters (boosters) pilfer such things as cosmetics, over-the counter medications, razor blades, teeth whitening products, baby formula, alcohol, video games and clothing which they barter. They sell it to "fences" who sell it on the blackmarket, return it to stores, sell it at flea-markets or online for a nice cash return. According to the Retail Council of Canada retail crime costs the retailers $4 billion a year! We are all victims because the consumer pays for that shrinkage in the form of higher prices. Welcome to the thriving world of organized retail crime where a quick, tidy and dirty profit is a shoplift away.